Led by Adrianne Fitzpatrick (publisher and owner of Books To Treasure) and Wendy H. Jones (successful crime writer), the ACW Writer Day on Saturday 12th March at Widcombe Baptist Church, Bath, provided me – and a church full of my fellow-writers – with a wealth of fresh information about book publishing and marketing. The pictures I’ve included here are all about “authors out and about promoting their books”. Writers can often find themselves labelled as introvert, solitary and retiring – which of course is how the actual business of book writing gets done. But when it comes to marketing books, we were challenged to change our beliefs about ourselves. We can and will get out there, in person, marketing books, in a wide variety of places – and not just bookshops either! I was amazed to discover how many possibilities there are for venues for book-signing sessions.- cafes, shopping malls, even banks, to name just a few. As a result of this day I am now creating a new marketing strategy to reinforce the new beliefs I have about myself. 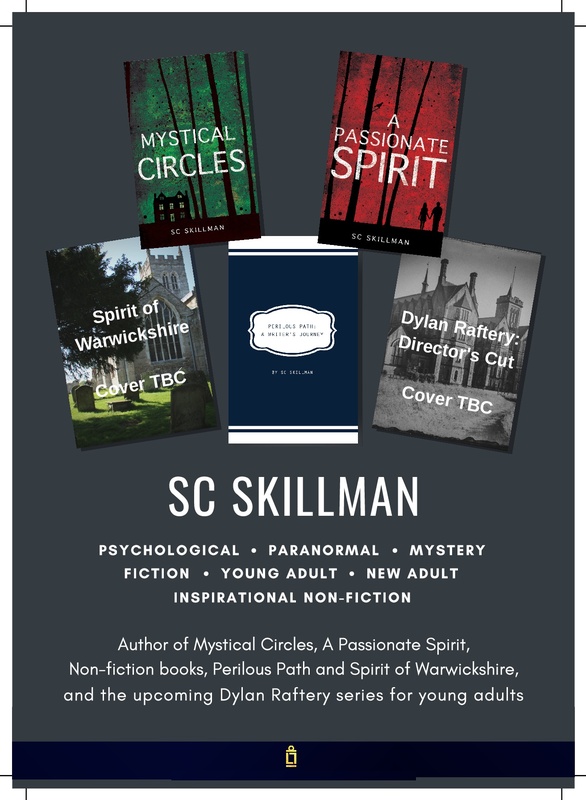 These are exciting times and I will be trying several new things over the next few weeks and months to get out and about with signed copies of Mystical Circles and A Passionate Spirit – plus a few extra surprising visual aids! Yes I can see that you are making a big marketing push and I am very impressed with what you’re doing! Good luck and may it bring in many more sales for you! Thanks for this encouragement to keep going. I always find this aspect tricky, especially as I write primarily for Christians (and am definitely an introvert). But I need to start thinking out of the box more! Yes that is what I’m trying to do right now as I read Wendy’s book and find myself thinking, “could I really do that?” (She dressed as Jack the Ripper to sell her books at one event). Well I know that is an extreme example and she is of course writing crime thrillers, but I think you have to be an outgoing personality to carry that sort of thing off! Lovely to be reminded of Philip S Davies’ splendid launch (and cake!) for the Destiny’s Rebel in Bakckwell’s Bookshop, Oxford. I am in the run-up to publication of my own first novel now (Timed Out – about an older woman trying to turn her life around) and I enjoy the challenge of trying to spread the word and get readers. I know that feeling. Wendy Jones would say “don’t let it stop you – just accept that’s happened and moved on”. One question she was asked was, “What if a book signing is a total failure and you don’t sell any books?” She said, “In that case, just have a cup of tea and chat to people and enjoy yourself, and then move on in your marketing strategy and take up the next opportunity. Keep going!” I have had those disappointments myself; I’ve listened to Waterstones managers saying they’re not going to host a signing for me, they want it to be a good experience for them and for the author. Again there is the fear of failure. It might not work, the author might sit there and not get any takers… but we have to have courage and keep going.